It may be banal to start with talk of the weather, but Wednesday was a beautiful night in our nation’s capital: sunny, warm but not hot, drier than normal, a light breeze to waft away one’s cares. In such weather, it seems a shame to spend an evening indoors, even for classical fans. What to do? A not-unpleasant vista on a summer’s eve. Photo by the author. The concert began and ended with marches: Karl L. King’s “The Mystic Call,” with effervescent flutes swirling above jolly tromping bass, and Louis Saverino’s “March of the Women Marines,” more straightforwardly ebullient. But much of the remaining repertoire showed off the band’s ability to play at a more relaxed tempo. John Mackey’s “Hymn to a Blue Hour” fit the twilight time perfectly, with the sky just beginning to darken after the sun set over Pennsylvania Avenue. The Marine Band made its harmonies glisten and shimmer, while Captain Michelle A. Rakers guided them effectively to a stirring climax and heart-rending denouement. The opening “night prayer” tune in the overture to Engelbert Humperdinck’s “Hansel and Gretel” sounded similarly luminous, like a candle flame with hands cupped to protect it against the wind. GySgt Sara Dell’Omo, moderating the concert, did a great job of introducing these works, which doubtless were unfamiliar to an audience including many children and at least one faultlessly quiet dog. She narrated some history about the works, but she also took care to associate a particular image with each piece – Mackey at his upright piano with the sounds of the city swirling around him, Hansel and Gretel huddling in the forest, the swirling river in Ron Nelson’s “Savannah River Holiday Overture” contrasted with the quiet on its banks. This is an extremely helpful way to bring in people who might feel adrift in music with an obvious narrative thrust but no words to go by. 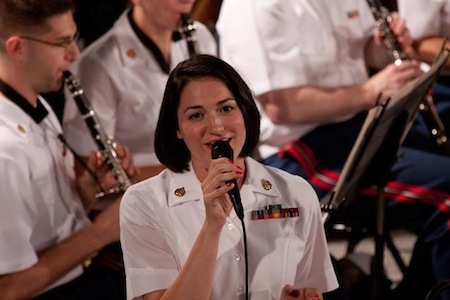 Sara Dell’Omo, courtesy Marine Band (though her hair was different on Wednesday). Those people got a double bonus when Dell’Omo picked up another microphone to sing two tunes with lyrics by Johnny Mercer, the poppiest part of a pretty meaty program for something outside. She had the brassy “Pardon My Southern Accent” down pat but occasionally was drowned out by the band’s otherwise-discreet amplification. No such problems arose in her “Moon River,” which had many members of the audience quietly murmuring along, in a way people can really only do outside without other people getting mad. The showstopper on Wednesday, though, was James Barnes’ “Duo Concertante,” a brief concerto for trumpeter MSgt Christian Ferrari and euphonium soloist SSgt Hiram Diaz, both of whom played with astonishing precision while never making a sour noise on their temperamental instruments. The fast outer movements bristled with activity, and the dueling cadenzas had me on the edge of my seat, but the heart of this work is the slow middle movement, where Barnes spins soaring melodic lines from a five-note motive. The Marine Band once again excelled in making gorgeous hushed tones, and the two soloists effortlessly spun out their elaborations of the central motive, intertwining with each other, the band and, it sometimes seemed, the gently darkening evening around them. I’m going to try to hit all the other military bands’ Capitol concerts this summer, and I expect a lot of fun, but it’ll be hard to top this one. 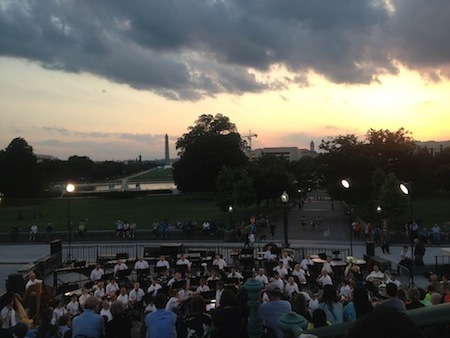 “The President’s Own” U.S. Marine Band appears each Wednesday night on the West Terrace of the Capitol and each Thursday night at Yards Park, weather permitting. July 10 and 11 are the 215th anniversary concerts, which will feature a new work written for the occasion by John Williams. 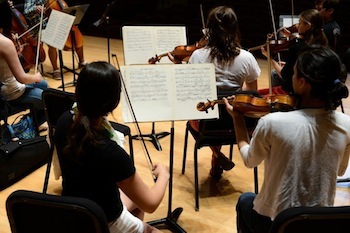 Every year, the National Orchestral Institute brings talented young musicians from across the country to the University of Maryland to make music together and otherwise deepen their craft. The NOI Festival challenges its charges right off the bat, with each player assigned to a chamber orchestra that has one week to prepare a piece and play it without a conductor. In the past, the students have met this impossible challenge surprisingly well. On Saturday night, the results were a little more mixed. Young, talented people hard at work. Courtesy Alison Harbaugh. Conveniently for your reviewer, this program repeated three pieces from this similar concert in 2010’s NOI Festival. (The young persons likely had no idea, of course, and I confess I forgot until I looked back at the earlier review in writing this one.) The first repeat on the program engaged the services of the young percussionists gathered in College Park, as nothing on the rest of the program demanded anything but timpani. In the above-linked 2010 review, I begged for a program note for Hungarian composer Aurél Holló’s “José/beFORe JOHN5,” and yes I typed that name correctly, thanks. In 2013, my wish was fulfilled with a spectacular note, mostly taken up with Holló’s explanations of the basis of the “beFORe JOHN” series, which is based on the number 153. Said explanation in turn contained a diagram, a quote from the Apostle John, numerological analysis of the many fascinating properties of the number in question, and an explanation that “José” is fifth in the series (thus the exponent to the fifth power…I guess) and an attempt to capture a Spanish influence. The four percussionists tasked with realizing this vision did so with verve, looking confident as they moved from clapping their hands to face-to-face duet marimba to banging an acoustic guitar with sticks. I didn’t count beats to find the 153, but they kept the work locked in a groove with very few wobbles, and as the work progressed its structure became clear and gained power. It reminded me of my constant wish for more all-percussion concerts — the timbres are more varied than folks think (as you can hear by listening to that YouTube link above), and there are so many interesting things contemporary composers are doing for these ensembles. So that was the first five minutes. Alberto Ginastera’s “Variacones concertantes” then kept the Latin tinge going and gave each section of the first chamber orchestra an opportunity to strut its stuff. This piece featured the best playing of the evening, including lovely cello-and-harp and double bass-and-harp duets to limn the evocative theme, lush strings in the first variation and to accompany ripe horns in the horn-focused variation, and eloquent wind playing in solos (though busier passages sometimes got messy). Most of all, they played with a rhythmic energy that served Ginastera well, especially in the rousing finale. After intermission, we had Richard Wagner’s “Siegfried Idyll” and the only non-repeat from 2010, the suite from Igor Stravinsky’s “Pulcinella.” The “Idyll” passed pleasantly but somewhat fuzzily, with strings not quite together for stretches and the horns not as bright and secure as those who had played in the Ginastera. “Pulcinella,” though, made it clear why orchestras normally use conductors, starting in the opening measures with the worst attempt at a unison trill that I have ever heard. In this ballet, someone really needs to decide how everyone is going to handle Baroque phrasing as refracted through Stravinsky’s piquant orchestration, but everyone on Saturday had a slightly different idea from his or her fellows. The strings felt each other out and became more unanimous as the suite progressed, but it wasn’t quite enough to make “Pulcinella” come to life. These kids’ll have a conductor (specifically, Rossen Milanov) next week and for the two Saturdays after that, and they’ll develop over the month they spend at the NOI. Were I available to attend them, I’d still go to the upcoming concerts — I’ve heard enough of the NOI over the years to know that bringing musicians this talented together often makes magic in music, even though it mostly didn’t happen on Saturday night. The NOI’s Saturday-night shindigs continue through June 29, but there are also free chamber concerts and a performance of “Peter and the Wolf” for the kids. See here for details. You are currently browsing the DMV Classical weblog archives for June 2013.